We visited Newark on a lovely sunny day in September 2013 and found the town to be very pleasant and full of character, with the romantic castle ruins reflecting beautifully in the river. 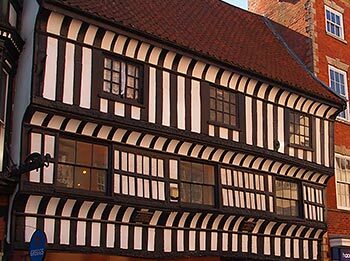 There are plenty of other interesting historic buildings to visit located along the riverside and around the historic cobbled market place in the town centre. If you are travelling to Newark by car, it is best to follow directions for the Castle Station and Town Centre, which should take you to the river, near to the castle site. Although there are ample car parks around the town an ideal place to park is next to the Riverside Arena (pay and display), which is just opposite the castle and gardens. 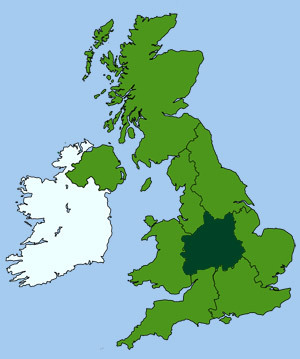 The Tourist Information Centre is also located near here, so it is an ideal place to start a tour of this lovely historic town. 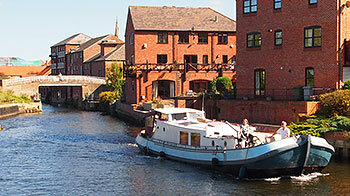 Starting from the Riverside Arena, walk along the river bank to the old Town Lock. If you linger here awhile you can watch the boats and pleasure craft negotiating the lock. Just behind the lock is a small park and sensory garden. 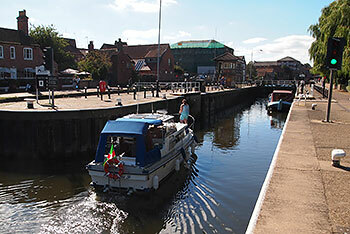 The waterway here forms part of the Newark Navigation; a series of man made channels or cuts, created to improve both navigation and the defence of the town. Carry on along the river bank past the lock and along the canal. To your right is the old dry dock where boats are still serviced and repaired. 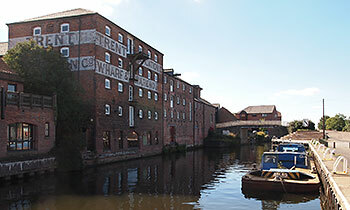 Lining the canal, on the far bank, are some of the oldest and most interesting industrial buildings in Newark. Carry on along the canal to the Mill Bridge. Just past the bridge on the right is the mill race and weir, once used to power the local industry but now just used as a quite fishing spot. Cross over Mill Bridge and walk through the archway in the warehouse on the left. This brings you into the yard of an oil seed mill, built in 1870. 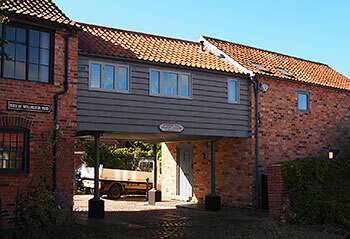 This building was once used as the Millgate Folk Museum but is now closed. Next door is a charming riverside pub called The Navigation, incorporated into the basement of the Trent Navigation Co wharf building. An ideal place to sit and watch the boats go by, with a drop of liquid refreshment. From here you can follow the riverside footpath through the warehouses. These old 19th-C warehouses once included a boilermaker, ironworks, maltings, brewery and glueworks - virtually all of which have now been converted into luxury riverside apartments. The warehouses were erected right next to the waterway to enable goods to be loaded onto barges for transport all over the world. A purpose build barge, called a Trent Ketch was used, that had a shallow draft of just 32 inches. Once you reach an alley way (running from the river to the road) turn right up the alley and then left onto Mill Gate street which follows on to Castle Gate. Once you reach the Corn Exchange on the left, cross over the zebra crossing and walk up Stodman Street towards the town centre. 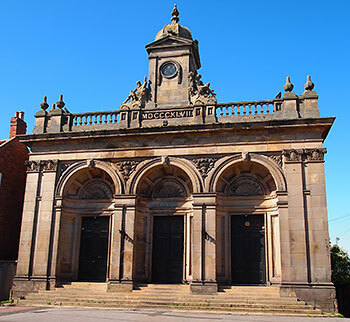 Newark Corn Exchange was built in 1848 in a grand Italianate baroque style. The exchange was once an important centre of commerce in the town and a centre for lectures and exhibitions. It continued to be used for trade up until 1978 and is now used as night club. 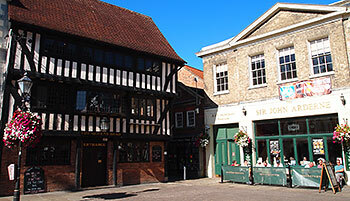 At the end of Stodman Street, on the right, is a fine late 16th-C half-timbered house with overhanging upper floors. This is where successive Governors of Newark lived during the Civil War (not open to the public). It is believed that a quarrel between Charles I and Prince Rupert took place here in 1645, which resulted in Rupert losing his position as Army General and Governor of Newark. A diagonal line of stones crosses the cobbles of the market place from the house, marking the pathway that the governor used to take to the Church of St Mary Magdalene. The old cobbled market place is a delightful blend of medieval and Georgian styles, watched over by the stately tower and spire of the parish church. On the west side of the square sits the elegant Palladian style Town Hall, designed by John Carr of York, built in 1774 of pale grey Mansfield stone. The rooftop balustrade is decorated with statues of a Lion, Unicorn and a figure of justice (symbols of the Royal British Empire). Near to the front of the town hall is the old town pump, bearing Newark's civic heraldic coat of arms. This consists of wavy bars on a crest, supported by an otter and beaver, topped by a bird (waterfowl) holding an Eel in its beak. All symbols that indicate Newark's riverside location. The motto: 'DEO FRETUS ERUMPE' translates as "Trust God and sally". There is a wealth of 17th and 18th-C brick and half-timbered houses surrounding and leading off from the market area, with many delightful arcades and alleys to explore. 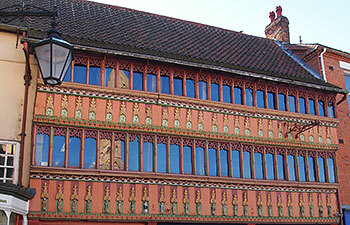 Next to the town hall is the Queen's Head Inn a finely restored 15th-C timber framed building. 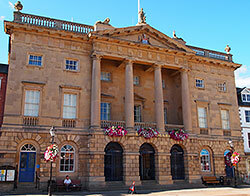 Many other fine buildings line the south side of the square, fronted by a 18th-C colonnaded. In the far corner is the early 14th-C White Hart Hotel. The oldest inn in Newark. Its colourful and ornate facade has finely carved figures all along its frontage. Next to the White Hart is The Arcade, if you walk through here it brings you out into Appleton Gate.